A long term investment. Replacing your roof may seem like a big decision now, but you'll love the long-term benefits. Eventually, all roofs wear and need replacement, but that fact doesn't make the process more fun for a homeowner. And sometimes, when a storm hits, roof replacement is all the more urgent. And because the safety of your home and family is at stake when your roof is in danger, it's important to know who to call. Trinity Exteriors, Inc's roof replacement experts are always available to make this difficult process a lot better for you and your family. First of all, we'll perform a roof inspection to see if repairs are an option. But if it is time for a new roof, we can help you find the best material for your home and style to transform your home. If you think your home is in need of a roof replacement, give us a call at 1-855-573-1653 or click below today. We offer estimates on all our work! Get a Roof Replacement Quote Today! Description: This homeowner saw some serious damage caused by leaking around his skylight and flat roof. He hired Trinity Exteriors because of our 3-Star Installer Certification with Velux Skylights. We repaired both the flat roof and old asphalt shingled roof, removed and replaced the domed skylights, and also added a sun tunnel. "I was most satisfied with my experience with the sales..."
"Our experience with Trinity Exteriors was one of the best..."
"Thank you, thank you, thank you! You have been wonderful!" No matter why you're interested in roof replacement, Trinity Exteriors, Inc has the tools and materials required to put you at ease. A solution for every situation. Even if severe weather forced you into a roof replacement, we can provide a fast, cost-effective solution. A home's roof makes up 40% of its curb appeal, and when the roof looks good, the house looks spectacular. Minneapolis roofing contractor Trinity Exteriors, Inc can help you choose the style and color of the roof you want, that's well suited for this area's climate and still looks beautiful. 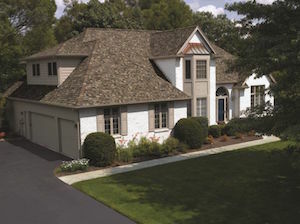 Sheets of plain colored shingles are reminiscent of an earlier decade in roofing design. 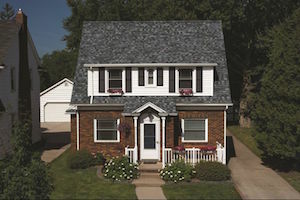 Trinity Exteriors, Inc is an expert in helping Minnesota homeowners leave their 1990s-style roofs behind by introducing them to modern color and style trends. From architectural shingles to timeless cedar, we can enhance your home's potential, and install your new roof flawlessly at a reasonable cost. I was most satisfied with how they did the job promptly and completely. Overall quality of the work is very good. We were also pleased that our final out-of-pocket costs didn't go over our budget. They took care of our roof in a timely manner and it looks like it was a quality job. From permits to clean up, Trinity Exteriors, Inc minimizes the hassles and disruption that can come with a roofing construction or restoration project. In order to uphold our superior standards, we maintain many certifications to ensure the highest quality of craftsmanship and customer service. Fully licensed and insured, all work is backed by both a workmanship and manufacturer's warranty. If you have any questions or concerns regarding your roof, please do not hesitate to contact us for assistance. Call us today to get started with an estimate! We proudly serve in Eden Prairie, St. Paul, Minneapolis, Burnsville, Minnetonka, Cottage Grove, Inver Grove Heights, Savage, Chanhassen, Rosemount and throughout the surrounding areas.